Boatright Timber Service, Inc. – Havana, FL land management, timber and logging operations, land management and reforestation. We supply firewood to Tallahassee, Havana and all of North Florida. Our sawmill cuts hardwoods such as oak, cherry and hickory wood. Our North Florida sawmill can custom cut cherry, oak, mahogany, birch, pine and other softwoods and hardwoods. We kiln dry our sawmill cut wood which makes a perfect piece of lumber for cabinets, interior or exterior custom building applications and just about any craft or woodworking project. Planks, boards, beams, and specialty custom sawmill work is just part of our services. We buy timber! We have been in business 25 years. 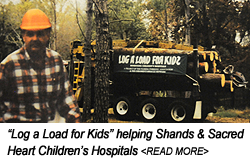 Beginning in 1983, after nine years as a Procurement Forester for others, Allen Boatright- a third generation forester/logger began Boatright Timber Service. Over the years, we have diversified, but have never left the cove of the woods and their many uses. We are a small company, but can do any size job. We will always be personal, available, and will handle every job with honesty, integrity and craftsmanship.